Kirchner Group pioneered their Portfolio Optimization model in 2004, and has been successfully deploying its program across a series of portfolios ranging from early stage venture to mid-market buyout to most recently hedge funds. We offer a suite of strategies and resources which enables us to provide customized solutions for a variety of complex fund management situations. In each aspect, we rely on our deep experience to unlock value. 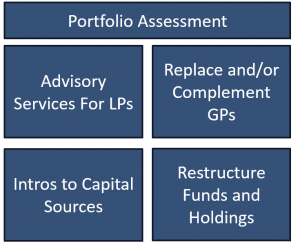 We have experience facilitating liquidity to LPs in funds that have viable management teams all the way through to assuming full management responsibilities in orphaned portfolios. We seek attractive outcomes for a range of stakeholders in troubled funds depending on the situation. Growth-oriented, lower-midmarket private equity fund with 8 investments located in the U.S. Northeast and Midwest. Investee companies typically have revenues between $10 mm and $75 mm, are profitable or nearing profitability on an EBITDA basis and require capital for expansion, acquisition and/or consolidation of their respective industries. Potential growth strategies include rollups within target verticals, buyouts and minority growth. A fund formed from five companies which were spun out of a large, U.S.-based consumer and commercial goods conglomerate. The underlying companies in the Fund are oriented to consumer products and sell through either retail or OEM channels. The investee companies are located throughout the U.S. and range in sales from $25 mm to $100 mm with many opportunities to improve operations and manufacturing efficiencies and develop new distribution channels in order to improve profitability.